Plasma is air in very high temperature. Plasma is very good value for money. 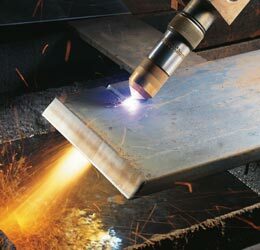 Cutting quality is better than oxy cutters while it is much cheaper than laser. That is why it is so widely used. NC hardware requirements are smaller than laser. Gearboxes and racks may have greater backlash. Asynchronous servos can be used. The combination of all the above keeps cost very low.